Seven popular machines have been approved to date for competition in the Manufacturers Cup Bike Racing Division. All are lightweight, high performance, high horsepower, 4-stroke, valve head singles. Certain oval track performance enhancing modifications will be allowed to the chassis. However, the OEM engine formula and plastic must be maintained. OEM logos must also be placed conspicuously on both sides of the machine. 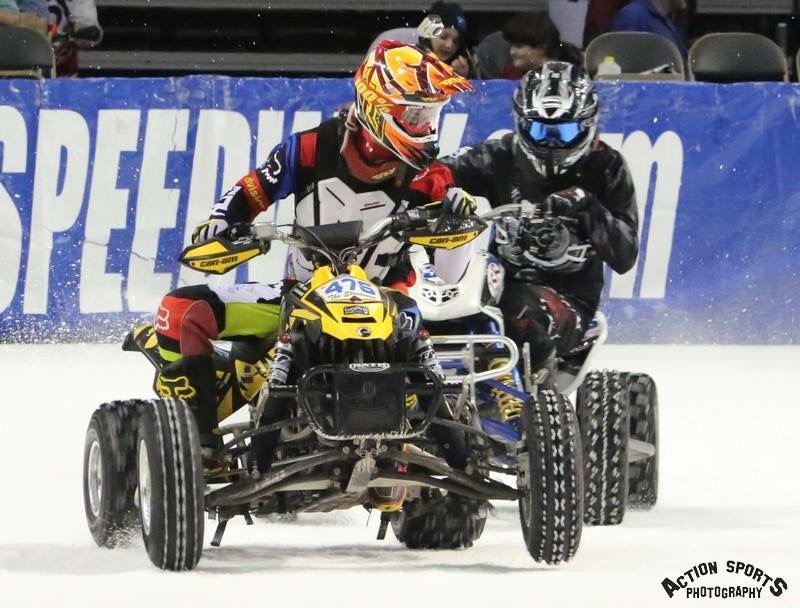 Technical and safety rules exclusive to ice racing will be in effect. BRAKES: Fully functional rear brake mandatory. Front brake must be removed or disconnected. TIRES: Rear 19″ directional knobby, Front tire choice optional. NO TIRE CUTTING. EXHAUST: Aftermarket exhaust pipe is allowed. No megaphones. Muffler optional. PLASTIC: Stock original appearing OEM plastic must be utilized. LOWERING MACHINES: To enhance oval track performance by modifying OEM suspension system, using aftermarket shocks & springs, and using 19″ front wheel is allowed. REAR SWING ARM AND FRAME MODIFICATIONS: Are not allowed. Stock OEM frames and swing arms must be utilized. ENGINE: Stock OEM configured 450cc, 4-stroke, single cylinder. Factory OEM stroke. Maximum overbore .010. Minimum displacement 449cc. A. Only Silver Rockets by Kold Kutter .160 Max studs are allowed. .160 inch as measured from bottom of washer to top of stud head. Silver Rockets by Kold Kutter are available from ICE and dealers in 1″ and 5/8″ shank lengths. Please contact Ken or Kristi if in need of screws. The minimum length of the threaded screw shank utilized in the rear tire studs shall be no less than 5/8″ measured from the bottom of the washer to the tip of the screw shank. B. No alterations of screws/studs. C. No washers or spacers under screws/studs. D. No overlapping of screws/studs. E. Zero (.000) clearance between screw/stud washers and tire knob. All machines must be equipped with front and rear tire guards. Tire guards can be constructed with plastics, fiberglass, Kevlar, carbon fiber or metal. No sharp edges or pointed objects can be present. In keeping with spirit of the Manufacturers World Cup we ask that you design and fabricate guards to be as least conspicuous as possible, not to significantly detract from OEM appearance. A flat black, or similar finish would be helpful in this goal. We want the OEM plastic to be the dominant image the spectators see and cameras record. The top of the guards may be bolted or riveted to the underside of the OEM fenders. Braces shall be used to strengthen guard. 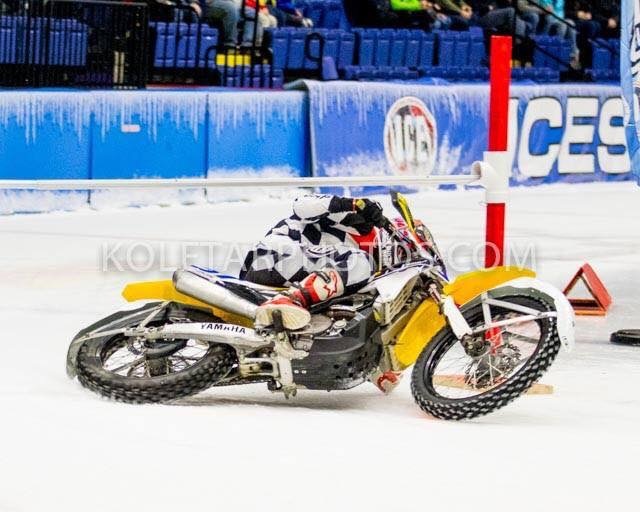 We recommend you place your ICE racing number and your last name on the back of your jersey or leathers. All pro machines, Bikes & Quads, must be equipped with a functioning tethered Dead Man. kill switch. This rule is mandatory NO EXCEPTIONS! Pro Riders must select a one or two digit number from the list of available numbers 2-99. If you raced with us last season your number will be reserved for the next racing season, provided you are racing the series that following year. Unless it is your National number; there will be no 3 digit numbers or numbers with letters next to them, unless you have prior approval from ICE. There will be no duplicate numbers! ENGINE: Any motorcycle/ATV type engine, production or race works that can be purchased new or used by competitors may be used. Displacement of engine is unlimited. Engine must be mounted Mid-Engine In front of the rear drive axle and behind front axle plane. FUEL TYPE: Unleaded Race Gasoline, Methanol or Nitromethane. BUMPERS AND NERF BARS: REQUIRED. NOTE: Bumpers are to be free from modifications, alterations or additions. No Roller Bumpers are allowed. DIMENSIONS: Machine shall be no wider than 50” at any location. SAFETY: This is everyone’s number one priority. KILL SWITCH: A self-closing throttle and a functioning Dead Man kill switch: are mandatory. NO EXCEPTIONS! 1. Sharp edges, pointed objects must be covered, balled or rounded. Handlebar ends, etc. must be plugged. An approved racing helmet/shatterproof eye protection (goggles or shield) must be worn. Also high top boots. Full coverage padded racing uniforms are highly encouraged. It is highly recommended that racers wear motocross type shoulder, back and chest protectors along with knee and elbow protection. 2. Excessive smoke from the exhaust of a machine can be grounds for a Black Flag disqualification. Please keep the machines running as clean as possible for the comfort and enjoyment of our indoor race fans. If you run gas, use unleaded. New racers…Please ask about the ICE tire rental program. Should you want to do up your own tires only Silver Rockets by Kold Kutter .160 Racing Studs will be allowed. They are available in 5/8” and 1” screw shank lengths from ICE. NO TIRE CUTTING. Please contact Ken or Kristi for screws if needed. There shall be no alterations to studs/screws, no washers or spacers under studs/screws, no overlapping of studs/screws. Base of screw must contact rubber of tire. 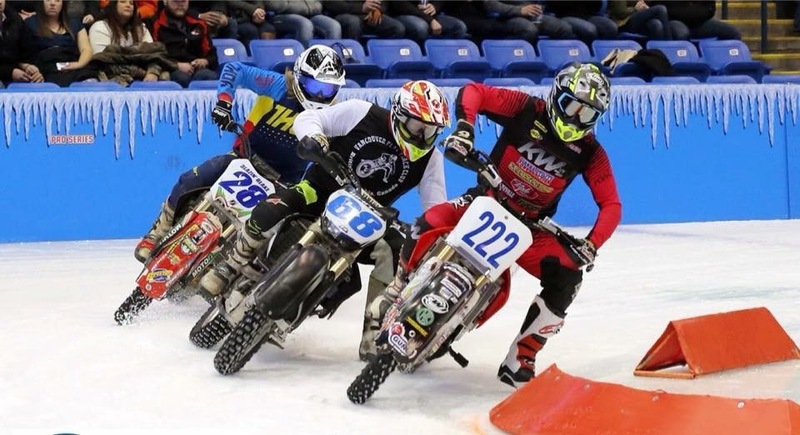 We also recommend you place your ICE racing number and last name on the back of your jersey or leathers. NUMBERS: Pro Riders must select a one or two digit number from the list of available numbers 2-99. If you raced with us last season your number will be reserved for the next racing season, provided you are racing the series that following year. There will be no 3 digit numbers or numbers with letters next to them, unless you have prior approval from ICE. There will be no duplicate numbers! Maximum front wheel diameter 12″ Rear wheel 10″. Shock and spring selections optional. ENGINE: Block must be OEM part number sold originally as 50cc displacement. SAFETY: Approved helmets, eye protection, long sleeve jersey or jacket, long pants, gloves and boots mandatory. Chest and back protectors, knee, shin, elbow, forearm protection recommended. AGE: Minimum age 16 with parental consent. Engine displacement. Riders must wear acceptable helmets and eye protection, high top protective boots, long pants and sleeves. YOU MUST HAVE A RACING NUMBER placed on the front and back of your quad. 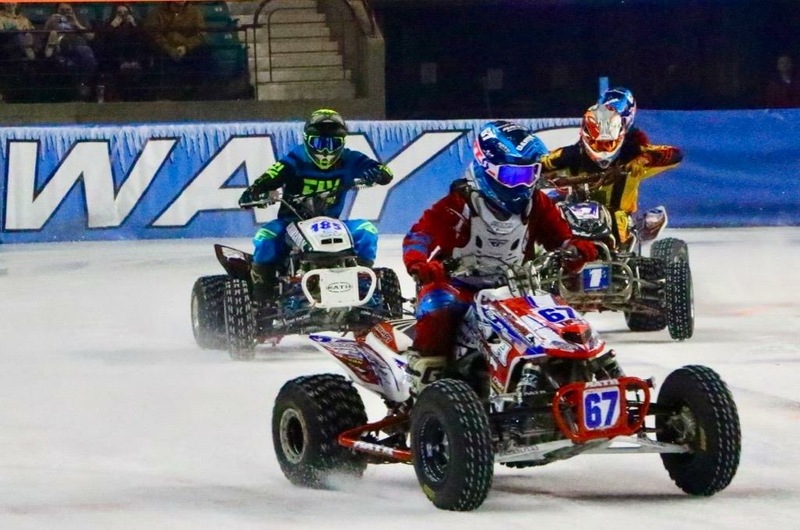 Quads must be clean with no dirt/mud or debris that could dirty pits and the ice surface. Unleaded gasoline only. 100 Silver Rocket by Kold Kutter screws will be provided at sign up. Amateurs are allowed to run 100 screws max. 1. WKA Speedway Kart chassis and body rules in effect. 2. Wheels must be 5. or 6. diameter, maximum width 10. 3. Tires optional. Must use Silver Rockets by Kold Kutter Racing Studs available from ICE. No tire cutting. 4. ENGINE: Open 4-stroke, single cylinder. One engine only. 5. FUEL: Methanol, nitro is allowed. 7. Must have legible minimum 6” tall numbers on right front and both sides. 8. Must have full speedway style body covering nose, front wheels and sides outside of nerf bars. Body can be either fiberglass or plastic material. SAFETY: Approved helmets, eye protection, gloves, shoes, long sleeve jacket and long pants are mandatory. Full racing suits are welcomed. AGE: Minimum age is 18. Racers age 14 – 17 with a minimum of 2 years previous racing experience may also be eligible to race with properly completed parental consent forms. 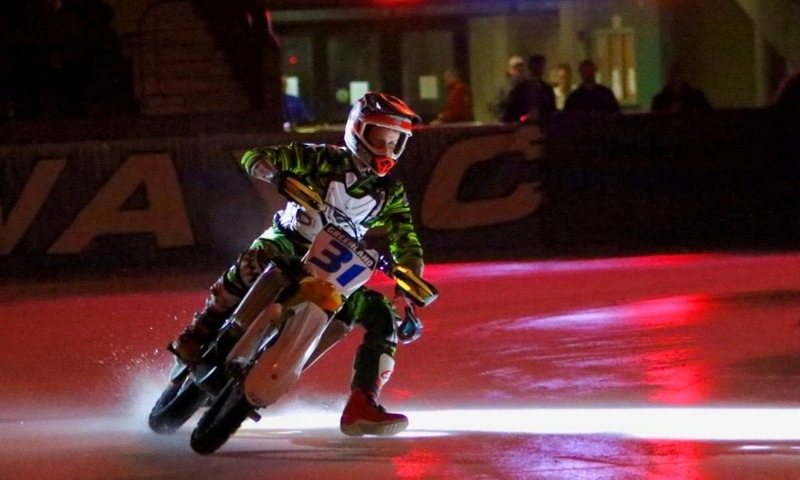 RACING FORMAT: Rider fields of 12 or more: 6 rider 6 lap Heats, 8 rider 8 lap Main Event.